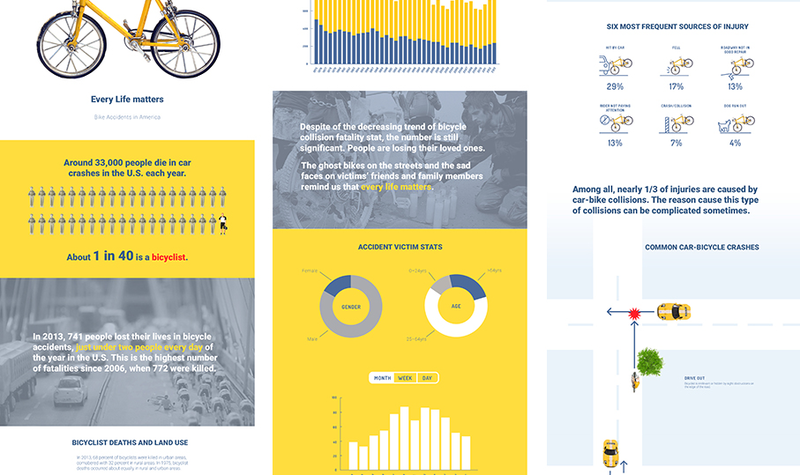 My teammate and I created an infographic website about bicycle accident in the United States. In this website, we tried to inform audience about different aspects of bicycle accident, such as demographic of victims, accident rate, causes of accidents, and common injuries. My role: research, ideation, organized contents, visual style, html, css . Jennifer and I were assigned to create a website about bicycle in America, and we were both interested specifically in bicycle accidents. After several discussions, we came up with some ideas about how to narrate our topic and what contents we want to include. We started our research on topics that were related to our contents. Different visual approaches we had tried before we headed to our final version. At the end, we decided to try a new layout so that interface can be more consistent. And with all the materials were ready, I coded the website after we both agreed on the final design of our website prototype.